If you grew up near Santa Barbara then you probably visited the Santa Barbara Zoo. 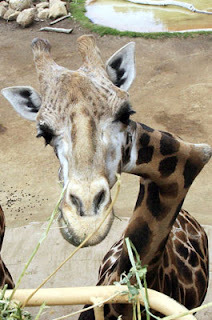 And if you ever went to the Santa Barbara Zoo in the last 20 years than you must remember Gemina, also known as the giraffe with the crooked neck. For as long as I can remember going to this zoo, I remember this giraffe. The Phi and PR Dad even had the chance to visit her the last couple of trips to the zoo. I was so sad to read that Gemina passed away on January 9th, 2008. She died of just plain old age at 21. Her crooked neck always intrigued me. In a place where all the other giraffes looked the same, she stood out from the rest. She was different and people loved her for that. PR Dad was a little weired out but I know he looked forward to seeing her. My heart is so sad that Gemina is no longer hanging out at the Santa Barbara Zoo. While I read the article I cried.Gemina was part of my wonderful childhood and would only be a brief memory for my daughter. Visit the Santa Barbara Zoo Website for more info and pictures of Gemina.